The compass is a relatively new invention in the history of navigation. It has only been used for this purpose for about a thousand years. People have been navigating land and water for several thousands of years. Despite its relatively recent invention it is indispensable in navigation. The compass allows navigators to stay on course even in the midst of a storm when they cannot see where they are going. The compass has many parallels with our spiritual journey. An interesting fact about the compass is that it is a tiny magnet. All magnets are attracted to each other at opposite ends or poles. The south pole of one magnet is attracted to the north pole of another magnet. 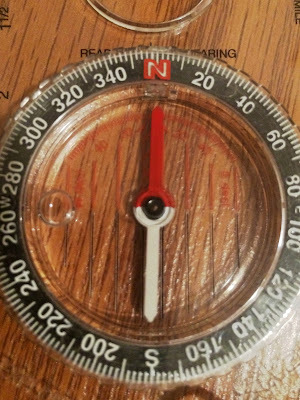 Many people don’t realize that the end of the compass needle that points north is actually the south pole of the compass magnet. This fact is a paradox. It does not seem correct at first, but it is true. There are many teachings in the bible that seem like paradoxes or contradictions. Some examples are God’s justice and mercy, Jesus is the lion of Judah and the Lamb of the world, Jesus said he is the Son of God and the Son of Man, Jesus had to die to give us eternal life. You have no doubt come across things in the bible that are complex, confusing, or appear to be contradictions. The comforting thing is that we don’t have to understand all these things to receive Jesus and the salvation he offers. It is important to study and understand the mysteries of the Bible. There are pastors and bible scholars who can help us understand the complex things. Do we need to understand why or how the compass needle works to be able to follow the needle pointing north? Of course not. Similarly, God does not require us to understand everything about the bible or salvation in order to be saved. As it says in Proverbs 3:5-6 we must not lean on our own understanding. All we have to do is trust that God knows what he is doing and will always point us in the right direction. Do we trust a compass more than we trust God and his Word? What paradoxes or complex things have you found in the Bible? What did you do to understand it better? How do we know that God can be trusted?